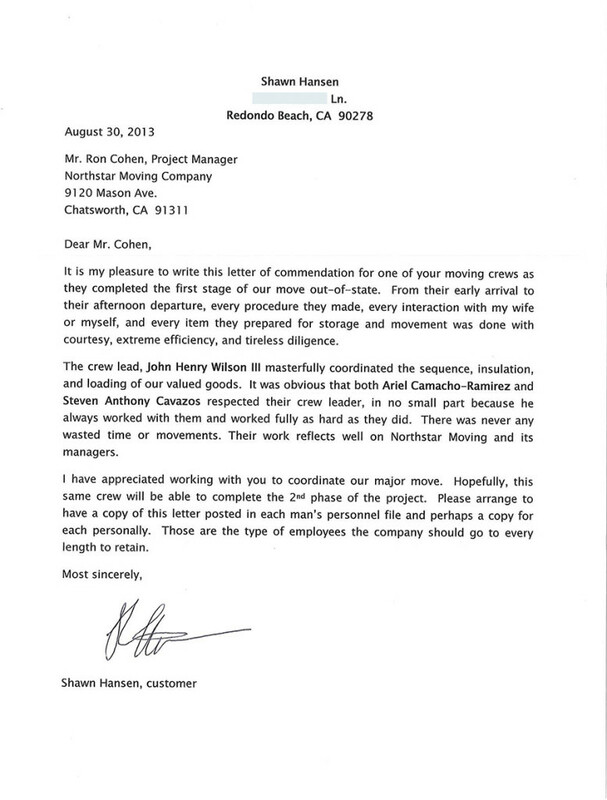 It is my pleasure to write this letter of commendation for one of your moving crews as they completed the first stage of our move out-of-state. From their early arrival to their afternoon departure, every procedure they made, every interaction with my wife or myself, and every item they prepared for storage and movement was done with courtesy, extreme efficiency, and tireless diligence. The crew lead, John Henry Wilson III masterfully coordinated the sequence, insulation, and loading of our valued goods. It was obvious that both Ariel Camacho-Ramirez and Steven Anthony Cavazos respected their crew leader, in no small part because he always worked with them and worked fully as hard as they did. There was never any wasted time or movements. Their work reflects well on Northstar Moving and its managers. I have appreciated working with you to coordinate our major move. Hopefully, this same crew will be able to complete the 2nd phase of the project. Please arrange to have a copy of this letter posted in each man’s personnel file and perhaps a copy for each personally. Those are the type of employees the company should go to every length to retain.